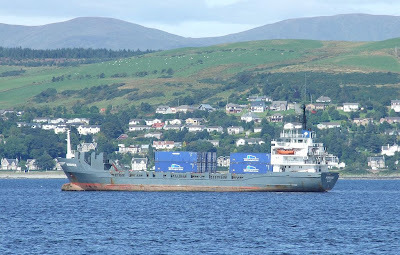 Although the picture was taken on a previous visit to the Clyde, the feeder container ship NORDSEE did call at Greenock today. This little ship, built in 1978 by the German Sietas shipyard, has been a regular visitor to Greenock for a good number of years, having spent some considerable time on charter to Clydeport. Currently running on the BG Freight Line service between Greenock, Southampton, Dublin and Belfast, NORDSEE has a capacity of 208 TEU. She is 88.68 metres overall, and is some 2,954 tonnes deadweight. Her owners are Walter Jess Schiffahrtsgesellschaft KG. NORDSEE has also made a number of visits to the Manchester Ship Canal, the signal mast above her accommodation being hinged for such occasions.